After the 9-11 attack on the United States, the brief moment of global sympathy for America soon began giving way to blame. In France and other quarters of Europe, and elsewhere in the world, it was said that the Americans had brought this violence upon themselves. The United States was a "cowboy" nation disinclined to abide by the will of the United Nations and other multilateral institutions and bent on pursuing its objectives at any cost. It was the "hyperpower" whose corporations manipulated world markets and whose riches were acquired at the price of Third World impoverishment. No wonder it had been attacked! 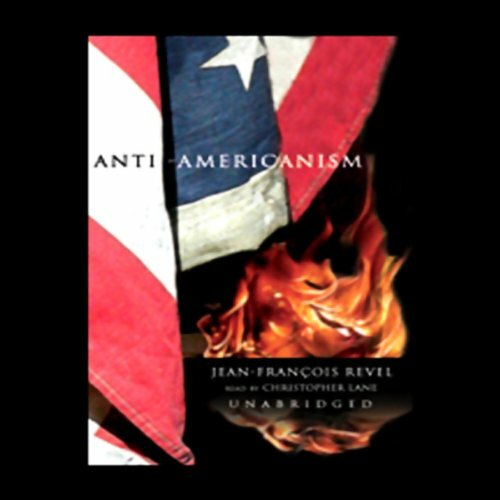 Angered by these assaults on a nation he knows and admires, the distinguished French intellectual Jean-Francois Revel has come to America's defense in Anti-Americanism, a biting and erudite book that, paradoxically, given his country's especially vehement attack on the U.S., spent several weeks last year at the top of France's best seller list. This was a fantastic book and has become my favorite in its category. Ann Coulter wishes she could write a book this powerful. It is done in an even handed presentation of European positions that fanatically attack the USA unfairly. Like most books, I'm sure there are generalizations to help make certain points, but there are so many anti-US contradictions presented that you just have to shake your head at the ignorance and blindness of the European media and leadership. There is a lot of truth in this book that hits you right in the face. Quite entertaining, although the generous vocabulary used in a concise format makes the audible version hard to grasp at times. I found myself rewinding many times because the pace of the information was at times too rapid to savor some of the stinging truths. Anyone wanting to know what the Europeans really think of America and why should listen to this book. The book is also a warning to America not to go down the political and social road Europe has chosen. 1. MYTH: Americans are ignorant of the "rest of the world," and Europeans are well informed about goings on in America. 2. MYTH: Americans are crass and uncultured, they worship money above all else, and they are crime-ridden and violent. 3. MYTH: Americans are reflexively unilateral and ignore the reasoned pleas for cooperation from their European allies. The root cause of all anti-Americanism, in the author's opinion? Nothing less than an ongoing war against free-market liberal democracy, one that has been waged by the far left and far right (which, combined, constitute more than a third of the electorate in France) since the early part of the 20th century. America draws the most heat not only because it represents the summit of achievement of free-market democracy, but because it is its most passionate advocate. Dispense with the notions that brash America is rubbing up against our more seasoned and even-tempered European cousins' sensibilities; the fact is that it is who we are and what we represent far more than what we do that galls the heart of the unrepentant socialist of both the National (right) and International (left) varieties. Who Ever Thought European Elites Were Logical? Written by a best-selling French writer (and known American-supporter), the book is an interesting calling-out of European governments and "intellectuals" for their unending attacks on the U.S. and shameless hypocrisy. A refreshing in-their-face slap at French intellectuals and their unceasing American bashing to cover up their own faults and scheming, it is heavily rooted in modern day issues. However, you will find enough historical context to be useful, particularly in Europe's colonial history. While not a deeply-researched piece, for a solid overview of European intellectual arrogance and outright dishonesty this is a worthy listen. I'm an American who has lived in "Old Europe" for the past 7 years. Life has been good here, but since the Iraq War the constant complaining about the USA has become very annoying. I too have asked, what did we Americans do wrong to warrant this hatred? This book helped me see that this is not a new phenomenon, but one that goes back decades and was only 'unmasked' by the War. Opinions are not based on American actions, but rather on Amcerica's successes and Europes failures. Revel points out so clearly what is rarely discussed in the New Europe: the self-inflicted disasters of two world wars that destroyed European leadership and handed world leadership to the USA on a platter. The America they complain about was created in large part by Europe's failures. That is not to say that the USA is without some blame. But there is a tendency to blame the USA for everthing, and be silent about the true dangers in the world. This is symptomatic of a dysfunctional psychological process most associated with the weak and 'victims.' As Revel points out, this behavior, associated with the Euopean elite, only makes Europe weaker and the USA stronger. NOTE to Readers: Revel's use of the term 'liberal' is different than from the normal political (negative) meaning in US politics, instead suggesting free-enterprise and consensual governance. Revel is one of the relatively few pro-American European intellectuals and in this book he tells us 1) why European anti-Americans are not to be taken seriously (intellectually, if not politically), and 2) what it is about the US that so infuriates them. Most European intellectuals, per Revel, are so immersed in their mid-20th-century marxist polemics that they will say nearly anything to keep their ideology alive. This leads to bizarre, self-contradictory anti-US diatribes that fail to survive any reasonable analysis. In the same line, the US's frequent social and political successes become living disproofs of their rigid ideological perspective and cannot be tolerated. The book is occasionally over the top in its examples of European silliness, but for the most part it's an excellent antidote to prevailing "intellectual" trends. Ravel is careful to note, at least once or twice a chapter, that a critique of the anti-Americans does not imply that the US is even close to flawless, and in his conclusion he suggests that the uselessness of the European critique makes it possible for Americans to ignore them on those (few) occasions when they are on target. Every American should read/hear this book! I love Europe and I thought I loved my country (America), but I never realized how much anti-Americanism I had internalized. If you have any interest in challenging your thinking on the issue of America's place in the world, read this book! If you want a refresher course in critical thinking, this is also an excellent book. I loved this book, surpisingly coming from a French author. You wonder how such an independant view could flourish amidst the media landscape portrayed by the author. This certainly won't be the no brainer best seller like those written by Michael Moore. I am not familiar with French media, but the dutch media are not very different from the sound of it. Allthough the content of this book wont be the stuff europeans typically stomach from our media, the style is very european, with lots of irony and cynisism. On a dry tone all usual cliches about the US are being ridiculed coming from europeans. Most cliches about the US (racial gettos with gun rich youth, tax climate that only benefit the wealthy, foreign policy that is directed to serving big industry interests abroad) are compared to French gettos, tax climate and foreign policy). Lot's of intellectual ammunition in here. The author did a great job in gathering data from newspapers and exposing the blatant bias that the media has towards the left and against the USA. The author also gives you a true International Relations view of terrorism and the balance of power. I truly recommend it. The truth is sometimes hard to swallow! This scathing exposure of the anti-globalists, anti-americanists, and liberal/socialist baseless stance is so overwellingly laid bare that I was stunned. The author did a superb job of showing how pointing the blame while ignoring your own role in the problem is the standard by which all anti-americanism is based. I highly recommend this book. The reader was decent but the points and dialogue given were more than adequate to compensate.